I have a blood clot in my ankle, and now my ankle is double in size and painful. Should I go to the emergency room? I had foam sclerotherapy 2 days ago. Follow-up ultrasound showed 2 blood clots, one of which is in my ankle. My ankle is now double in size and painful. Do I go to the ER??? I developed thrombophlebitis after EVLT and foam sclerotherapy, what should I do? I had EVLT performed on both legs. A week later, I had a foam sclerotherapy treatment. I developed thrombophlebitis following the procedures, and was given ibuprofen 600 for 2 weeks. I am finding that I still have no relief. There is pain behind my knee & inner thigh. What should I do? Can I get a full body massage after the Sclerotherapy and, if so, how soon? It has been almost 3 weeks since I had the procedure. Is it OK to go for a full body massage? If not, when will I be able to go? Can sclerotherapy have a rebound effect and not only cause more spider veins, but also make the treated ones more prominent? I've had four rounds of sclerotherapy over the course of a year. Now they're much much worse, and there are new clusters of veins around the injection site. Is it possible sclerotherapy just doesn't work for me? How long after foam sclerotherapy injections will it take the vein hardening to resolve? Can foam sclerotherapy be toxic? Is it bad for your health to have sclerotherapy? It seems dangerous to inject chemicals like that directly into the bloodstream. Couldn't they spread and cause damage to other veins/areas of the body? How can I remove stains created by injections? I have done several procedures Foam Sclerotherapy, injections, etc. This has caused those areas to stain. Also the pain continues especially when I'm on my mentral cycle, which causes it to be even more pruple and almost black in color. Sclerotherapy to get rid of big veins on hands? I hate the big veins on my hands. Is it safe to get rid of them with sclerotherapy? My veins look and feel worse after I had foam Sclerotherapy. I had the procedure 2 months ago and they feel hard, are throbbing and very pigmented. 20 years ago I had liquid Sclerotherapy and was bandaged for one month. The veins weregone when removed.Two months after my foam sclerotherapy my veins are still there. I know brown pigmentation takes a while to fade. The only difference is that this time I was only given compression stockings, not tight, to wear for 1 week. I've been wearing my own (stronger) stocking for 7 weeks, but no improvement. I'm very disappointed. Will the veins ever improve? Can Foam Sclerotherapy in a perforator vein leak into a deep vein? I had the VENUS procedure done 4 weeks ago along with foam sclerotherapy into a perforator vein about 3" above my ankle. Ultrasound shows a thrombosis in this area. It is still hardened, tender, and has not improved. What should I expect my surgeon to do? Can you explain blood clots related to superficial vein thrombosis? I am thinking about having foam sclerotherapy and I was once told by a doctor that the blood will clot from the foam and then the foam shrinks the vein. Can you explain this process? How long does the blood clot stay there? Is it a concern, and is there a risk of developing other problems from this treatment, such as cancer? What is the best method of treatment for bulging blue ankle veins? I have developed protruding blue veins around my ankle (my achilles heel area) and generally on my foot. Would foam sclerotherapy or just sclerotherapy be suitable in treating this? Would it help resolve my ankle aching on hot days? what are the advantages (if any) over Asclera and also, must a compression stocking be worn after the proceedure AND EXACTLY for how long? Would foam sclerotheraphy work if I'm taking warfarin? My doctor says it's okay but I thought veins had to clot in order for the sclerotheraphy to be successful. If I've had sclerotherapy, when is the soonest I can fly? If you develop phlebitis after foam sclerotherapy, what happens to the leg? My leg aches continually especially in warm weather. Can this be eradicated with more foam to reduce the refluxing veins? What are my chances of getting phlebitis again in this leg and how long should I leave it before having more treatment? Is it very painful to have labia veins treated with sclerotherapy? Can prominent blue veins in the foot/ankle be injected? I had phlebitis which has left my short saphenous vein distended and aching around the foot, ankle, and calf. How is this problem best treated? What procedure treats the small ulcers after sclerotherapy? Can large, bulging veins be treated on feet? I have many bulging veins on both feet. Duplex ultrasound showed no reflux or insufficiency and that veins are not varicose. It was recommended that I do nothing since there is no need. If want to fix them for cosmetic reasons, can they be treated? If so, what's the best procedure? Is sclerotherapy the right treatment for buldging veins on the feet, or is there a better procedure? I have bulging veins on my feet that concern me health-wise. 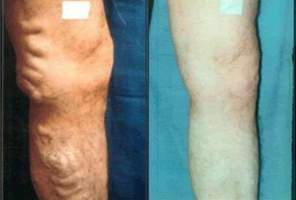 Can they be treated using sclerotherapy? Or, is there a better procedure for this particular area?